I love seeing how happy and free little kids are when they’re dancing to music. Dance speaks to young children in so many ways. 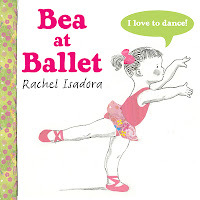 Share these favorite books with your little dancers and enjoy the celebrations they inspire. Preschoolers enchanted with ballet will love this simple introduction to ballet. Young Bea goes to dance class with six other preschoolers, four girls and two boys. After getting dressed in her leotard and ballet slippers, Bea peeks into the studio, excited and a little nervous, too. The class starts by sitting in a circle, clapping to the music — something preschoolers do all the time. Different elements of ballet, from the five basic positions to the equipment, are introduced clearly and simply. Isadora’s simple, understated illustration style keeps the focus on the children. Rachel Isadora began dancing at the age of eight. She trained at George Balanchine's School of American Ballet and has danced professionally in New York City, Boston and London. Ms. Isadora also lived in Africa for 10 years, and many of her other books reflect her love for this continent. You can see her portfolio of oil paintings on her website. Isadora's love for ballet shines through at each step. "I liked Bea the most because she was wearing pink and I loved pink too. The pictures were very special and lovely." For more books to share with little dancers, see this month's Bookshelf article in Parents Press. The review copies were kindly sent by the publishers, Nancy Paulsen and Penguin Books. If you make a purchase using the Amazon links on this site, a small portion goes to Great Kid Books (at no cost to you!). Thank you for your support. This one is on my wish list. Thanks for the reinforcement that yes, this will be a good choice for us. Hi, I'm trying to contact you about a book giveaway I'm doing on my blog...your 'email me' link doesn't seem to be working for me. please email me mmacmccoy@gmail.com. Thank you!